1) Identity is context-specific and can change (Johnston 2012). In this paper, science identity refers to whether students can relate to scientists, the interests and characteristics that they share. 2) Stereotype threat refers to situations where an individual is aware of negative stereotypes associated with one or more of their identities. When people are made aware of the identities that are negatively stereotyped, that awareness can consciously or subconsciously decrease their performance. For further reading, see Steele 1997 and National Academies of Sciences, Engineering, and Medicine 2018. 3) A way to think of possible selves is to ask, “Am I like this person? Do I see characteristics in this individual that are already part of me?” Rather than focusing on what is different or might be aspired to, this idea focuses on traits that are already present in allowing someone to identify with that particular person or role. This idea is discussed further in the introduction of this paper. 4a) Metacognition is a term applied to a broad range of ideas, contexts, and fields of study (Tanner 2012). In brief it can be thought of as thinking about one’s own thinking and trying to understand what one knows and why (National Research Council, 2000). 4b) The Scientist Spotlights homework assignments were designed to have students reflect on what they learned by reading biographies of scientists. What do students know and why? What ideas are not clear and what could they do to learn more? 4c) The hypotheses being tested in this study required providing students with examples of scientists that do not fit common stereotypes. Therefore, the Scientist Spotlights highlighted scientists that encouraged students to think about people that differed from the stereotypes they held at the beginning of the course. 5) In an educational study, an intervention is a purposeful change in a learning experience whose effect is being tested. In this case, the intervention was the use of the Scientist Spotlight homeworks. The control, non-intervention, sections instead completed readings and responses that also required metacognition, but that did not feature biographies of scientists. 6) Longitudinal data in education studies can be collected over weeks, months, or years. The intent is to determine if the impacts of a particular learning experience persist over time and, if so, to what extent. 7) Equity, diversity, and inclusion embrace environments that enable students of all abilities, backgrounds, and experiences to learn (Miller and Tanner 2015). Scientist Spotlights allow more students to see themselves as potential scientists or to see scientists as people they can relate to, thus helping them connect to the course material. Recently, there has been an increase in research analyzing the impacts of equity and inclusion on student outcomes. CBE--Life Sciences Education has published two special issues that highlight this research (September 2018 and September 2016). Introductory essays in these special issues help to frame the larger picture (Gibbs and Marsteller 2016, Gibbs 2018). 8) The first paragraph of the Introduction states why having stereotypes about scientists is problematic and notes that mainstream media and many college classrooms tend to reinforce these stereotypes. This paragraph frames the research question about testing an intervention that challenges preconceptions of who does science. 9) Sense of belonging refers to an individual’s feelings towards being welcomed or included as part of a group. It positively influences retention and motivation in college students (Hurtado and Carter 1997, National Academies of Sciences, Engineering, and Medicine 2018). 10) Achievement gaps refers to differences in performance measures between different groups of students (National Education Association). Its origins are rooted in a myriad of factors including cultural, economic, gender, and ability differences. Recent research efforts, such as this paper, are focused on finding ways to reduce the impacts of differences in student populations. Importantly, efforts to identify ways to turn what have often been viewed as deficits into assets for student learning are yielding positive outcomes in reducing differences in student performance (National Academies of Sciences, Engineering, and Medicine, 2018). Some researchers are pushing back on the concept of achievement gaps, because--inadvertently or not--the term lays blame on individuals for not achieving, which embodies a deficit model to improve equity. The term opportunity gap, however, places the responsibility of achieving equity more on the institutions and social structures (Johnson-Ahorlu 2012). 12) Equity gaps, a more general concept than opportunity gaps or achievement gaps, refers to the fact that our educational system is inherently unequal in how it serves different students and in its effectiveness in meeting the needs of the diverse populations that comprise our educational system (Malcom-Piqueux and Bensimon 2017). 14) Social comparison theory focuses on the idea that people make judgements about themselves by comparison with others. These comparisons can analyze both positive and negative features, characteristics to emulate or to avoid. Scientist Spotlights provide a comparison population that helps students relate to these role models and identify characteristics to emulate. For a historical perspective on social comparison theory, see Wood, 1989. 16) Identity is not a simple construct; multiple factors are involved and there are individual differences and context-dependent components. Identities are personal, reflecting how someone sees themself in the world. However, identities also have social components, reflecting how society views that individual’s membership or association with a group of people. These personal and social components influence people’s choices (National Academies of Sciences, Engineering, and Medicine 2018). 17a) This section draws distinctions between the ideas of role models and possible selves, a distinction that helps illustrate how these concepts could reduce stereotype threat. 17b) The idea of possible selves is a feature of the research design because Scientist Spotlights are purposely selected and presented so that many students can relate to one or more aspects of the featured scientists. 18) This framing is particularly helpful. The way the hypotheses are presented is aligned to the experimental design that is outlined in the Methods. The Results section is organized in subsections addressing each hypothesis. 19) Mixed methods analyses involve using both qualitative and quantitative data, using the strengths and complementarity of these approaches (Warfa 2016). The term mixed methods can be applied to different experimental designs. One example would be conducting interviews alongside quantitative surveys and then comparing the two data sets. Another approach, as done in this paper, transforms qualitative information into numerical data by coding student responses into categories and then noting the frequencies of responses within those categories. 20) This section explains how the authors designed their intervention, using a particular Spotlight as an example. This explanation provides the context for the rest of the Methods. 21) Metacognition is a term applied to a broad range of ideas, contexts, and fields of study (Tanner 2012). In brief it can be thought of as thinking about one’s own thinking and trying to understand what one knows and why (National Research Council, 2000). 22) Quasi-experimental design is an experimental design where the groups are not truly random. This often reflects both practical and ethical considerations in the design of studies involving human subjects. In this paper, the students cannot be randomly assigned to sections of the course because they construct their own schedules (Trochim 2006, Price et al. 2015). 23) In a nonequivalent-groups design, groups are not randomly assigned and most likely, not equivalent. This approach is common in educational studies, for example, comparing classes offered during the same semester or courses with the same instructor. It is important to try to control as many variables as possible to make the groups as equivalent as possible. It is also critical to compare the groups noting how similar they are, for example with respect to grade point averages, year in school, demographics, or majors. Because the interpretation of results and conclusions can depend on these similarities, authors will frequently note for the reader factors to consider when comparing the nonequivalent groups (Trochim 2006, Price et al. 2015). 24) Readers need to know about the student population being studied so that they can contextualize the data. Here, because the idea of possible selves is pertinent, the authors describe the demographics and interests of the population. 25) This aspect of the intervention is critical. Because the authors want to explore the ideas of possible selves and relatability, they need to highlight scientists that have characteristics in common with the student population being studied. 26) Access to instructional resources, in this case the Scientist Spotlights, is important both for researchers interested in further investigating the impacts of these interventions, as well as for instructors looking to implement these interventions in their own classrooms. The authors and others are continuing to develop more Scientist Spotlights (Monahan 2018). This expanding set of materials will be available later in 2019. 27) Providing these resources in supplemental materials gives the reader additional details with which to compare the control group to the treatment group. 28) This section details the quasi-experimental approach that the authors use. It explains features of the design that help compare the two treatments, and it points to strengths and weaknesses of a quasi-experimental approach more generally. A truly random assignment to the control and treatment groups is not possible because of the way students register for their courses. However, the authors use section-level comparisons to document equivalencies and differences between the groups. 29) The reason for calculating the weighted means is to correct for the fact that different groups can have different sample sizes and compositions in the two populations being compared. For example, one population may have more men than the other (Online Stat Book). If men tended to have lower course grades and there were more men in the experimental group, then it might inaccurately seem that the experimental treatment made no difference (false negative). 31) This detailed description of the population helps readers evaluate how generalizable the outcomes are. 32) It is appropriate to include additional details in Supplemental Materials that allow the reader to dig more deeply into the data or the background information. Here, the authors define the groups they are using in the main text, and use supplemental materials to provide detailed demographic data. 33) Many different populations can be considered “underserved,” so it is essential for the authors to define how they use the term. The Supplemental Materials provide more information on subgroups, as well as a basis for comparison between the control and treatment populations. 34) When the authors coded student responses, they identified common categories and themes across all responses and then noted which answers incorporated specific themes (Warfa 2016). The coding scheme they used aligns with criteria they developed in a previous study (Schinske et al. 2015). They also calculated the frequency of responses within each category. 35) Here the authors refer to a previous study where they tested the validity of the “stereotypes prompt” that they use again in this study (Schinske 2015). 38) Another element of their study design was to test for longitudinal effects of the intervention. Thus, these effects were only measured in the Scientist Spotlight Homework students. 40a) Interrater correlation (also known as interrater reliability) is helpful to report, because data coded by people is always subject to different interpretations. For more on interrater reliability, see Trochim (2006). 41) The authors decided to use an analysis of variance (ANOVA) to compare pre- and post-tests to look for statistical differences between the frequencies of stereotypes and nonstereotypes in students’ responses. These analyses needed to account for the fact that each student contributed two data points (pre-intervention and post-intervention scores), which could inflate the difference between treatments and lead to a false positive; they accounted for this by using repeated measures. They also needed to account for the fact that covariates, like gender and race, could also differ between treatment groups, and could also lead to a false positive. They accounted for this by using analysis of covariance. The name of this technique is repeated-measure analysis of covariance (RM-ANCOVA). For more information, see Online Stat Book. 42) Covariates were included because they account for uncontrolled features of the sample population that may influence the results (Minitab 2017). In this case gender, race/ethnicity, and course section are traits within the sample population that may impact the outcomes of the study. Paying attention to these uncontrolled variables may inform the interpretation of the results. 43) The authors conducted a factor analysis using an instrument published by Seymour et al. (2000), and found that, with this study population, the instrument included two distinct constructs (Supplemental Materials G, H). The authors were only interested in the “Science Interest” construct, so they used only the questions about Science Interest in their study. 44) To understand the effect of Scientists Spotlights over the course of the term, the authors use a common experimental approach called pre-post testing (Theobald and Freeman 2015). They administered the survey three times: on the first day of course, the last day of course, and six months after the course ended. 45a) The Results are helpful to read while consulting the list of scientists who were featured in the Scientist Spotlight assignments found in the Supplemental Materials, Part A. 45b) The authors use pseudonyms to refer to students to protect their identities. 45c) Note the number of different students whose quotations contribute to this Results section. The authors pull examples from the breadth of their sample adding richness and detail to the study, rather than presenting a statistical distribution of them. 46) In qualitative research like this, quotations are data and are, therefore, included in the Results. The authors must explain why the quotations are representative of the whole data set, as well as providing context for the quote. They may explain how the quote informs the hypothesis being tested and how representative this kind of content is. 47) After each quotation, the authors provide information about the student’s demographics and the context for the quote. 49) This paragraph and Table 1 illustrate the mixed methods approach used in this study. Surveys were open responses to the “stereotype prompt” introduced in the Methods. Survey results generated both qualitative and quantitative data. The prevalent themes emerged from a qualitative analysis of the ideas students wrote in the surveys, and the authors calculated the frequency that each theme was evident. 52) In another paper, Schinske and colleagues (2015) explore the kinds of stereotypes that students have about scientists. They classify some of these as positive, because they are associated with characteristics that are commonly valued in our society, such as being intelligent, successful, and, passionate. However, even positive stereotypes can have negative impacts for those subject to them (e.g., Cheryan and Bodenhausen 2000). 53) Note this student’s intersectional identities. She is female, Black, and Latina. Legal scholar Kimberlé Crenshaw introduced the term intersectionality to describe and explore the impact of holding multiple, marginalized identities (Crenshaw 1989, Davis 2008). 54) The authors add a dimension to the table by coloring rows depending on whether the themes are related to stereotypes about scientists (Schinske et al. 2015) , ideas that are definitely not stereotypical, and themes that specify scientific fields. Because not everyone can see the difference among the colors, the authors also add codes to signify this information in each row, (s), (n), and (f) respectively. 55) The authors conduct pre-post testing to record systematically how students’ ideas of scientists changed. This is can be helpful to do in our own classes, as well (e.g., Smith and Knight 2013; Price et al. 2016). 56) The authors asked the students to reflect on how their ideas of scientists changed. This type of metacognition--awareness of what they are thinking--promotes deeper learning (National Academies of Sciences, Engineering, and Medicine 2018). 57) The authors support their quantitative result--a statistically significant increase in the number of student answers that describe scientists in nonstereotypical ways--with qualitative examples that illustrate how thoughts have changed. 59) Some of the analysis of student quotations blends into interpretation, making it hard to distinguish what belongs in the Results and what belongs in the Discussion. Here, the authors contextualize one of their results to explain why they conclude that students view scientists as normal people. 65) The result is that the student makes the inference that the breadth of research questions that scientists address depends on the diversity of the scientists themselves. The inference belongs in the Result section, because it is the student’s conclusion, rather than the authors’. It is worth noting that the student’s observation is one of the major reasons cited for the importance of diversifying who does science in other studies (Valentine and Collins, 2015). 67) The quantitative result stated here is supported by students’ quotations later in the paragraph, exemplifying how the combination of qualitative and quantitative results is so powerful. 70) It is valuable to consider the response rate of a survey to understand how representative the results are. In some cases, response rates of ≥ 80% are required. Here, however, the demographic characteristics of small sample of respondents match the demographic characteristics of the larger population. The authors follow best practices to conclude that the data are still informative (Finchman 2008). 71) The next two sections of the Discussion explain how to adopt this approach in a classroom in a way that does not take too much class time, homework time, or grading time. Scientist Spotlights are, therefore, an efficient addition to make in a course, and an addition with many positive repercussions. 72) In addition to helping students recognize the diversity of scientists, the activity helps students engage with issues of social justice (Chamany et al. 2008). This engagement can, in turn, help students realize the benefits and outcomes of science (Understanding Science Team, 2018). A number of organizations are beginning to publish even more activities combining social justice and science instruction (e.g, Madden et al. 2017, Science Education for New Civic Engagement and Responsibilities 2017, Science Educators for Equity Diversity and Social Justice 2017). 73) Students’ excitement about Scientist Spotlights can inform instructional practice. When students are excited about the content, instructors can use this energy to engage their students more broadly in the subjects being discussed. 74) Including Scientist Spotlights in nonmajors courses might recruit students into science majors. Scientist Spotlights may also help retain students that are already pursuing STEM majors. Students enjoyed learning that some of the featured scientists discovered their passion for science later in life. 75a) Here, the authors consider why the Course Reader Homework was not as effective, even though the scientists in the examples had counterstereotypical qualities. 75b) The authors conclude that students must engage with and reflect on the material to make it effective and suggest ways to help insure success when using Scientist Spotlights (National Research Council 2000). 76) Effective instructor talk (Seidel et al. 2015) can increase buy-in for an activity. The authors found the students willing and eager to complete these assignments. Part of this willingness may be attributed to the way the assignment was framed in class, as well as the open-endedness of the prompt,allowing students to choose what they focused on in their assignments. The instructor recognized the students’ contributions by sharing segments of their writings aloud in class. 79) An exciting outcome of this paper is a project funded by the NIH in 2018 to create a searchable, online repository of Scientist Spotlights. This repository will allow instructors to search for scientists with different demographic features to highlight in their courses (Monahan 2018). 1) LSE now requires that the Methods section of a paper includes either IRB approval or a statement of exemption for any article that involves human subjects. That includes all data from surveys and classroom observations. Schinske et al. developed a method to spotlight the biographies of scientists with life experiences that were similar to those of the students they teach at a minority-serving community college. Their work is inspired by the desire to broaden students’ conceptions about who scientists are--and who can become scientists. The authors designed and tested the efficacy of short homework assignments in which the students read and answered questions about scientists. They find that the Scientist Spotlights do, in fact, foster a more diverse sense of who scientists are. The activity has been so successful that it inspired creation of a database of Scientist Spotlights that will be available later in 2019 (Monahan, 2018). We selected this article for “Anatomy of an Education Study” because of the positive impact that Scientist Spotlights have on students and because it models one approach to rigorously evaluate the effectiveness of an intervention, combining the strengths of qualitative and quantitative research components. The authors clearly state the hypotheses being examined, describe the rationale behind the experimental design, and carefully walk the reader through the analyses. Moreover, the fact that the study occurred at a community college (associate's colleges under the Carnegie Classification) is particularly valuable. Community colleges represent the largest population of post-secondary students. Elsewhere, Schinske and colleagues point out that over half of biology undergraduates attend community colleges, but only 3% of the research articles about college biology education published from January 2012 through September 2015 included community colleges (Schinske et al. 2017). Studies at community colleges are also particularly valuable because students from historically marginalized groups constitute a large percentage of their students. These gaps indicate the need for new studies involving these student populations. We thank Jeffrey N. Schinske and Heather Perkins for answering questions that arose as we annotated this article and for their editorial contributions. We also thank Shayla Shorter for calling our attention to websites that disseminate science teaching modules that incorporate social justice. Research into science identity, stereotype threat, and possible selves suggests a lack of diverse representations of scientists could impede traditionally underserved students from persisting and succeeding in science. We evaluated a series of metacognitive homework assignments (“Scientist Spotlights”) that featured counterstereotypical examples of scientists in an introductory biology class at a diverse community college. Scientist Spotlights additionally served as tools for content coverage, as scientists were selected to match topics covered each week. We analyzed beginning- and end-of-course essays completed by students during each of five courses with Scientist Spotlights and two courses with equivalent homework assignments that lacked connections to the stories of diverse scientists. Students completing Scientist Spotlights shifted toward counterstereotypical descriptions of scientists and conveyed an enhanced ability to personally relate to scientists following the intervention. Longitudinal data suggested these shifts were maintained 6 months after the completion of the course. Analyses further uncovered correlations between these shifts, interest in science, and course grades. As Scientist Spotlights require very little class time and complement existing curricula, they represent a promising tool for enhancing science identity, shifting stereotypes, and connecting content to issues of equity and diversity in a broad range of STEM classrooms. Whether or not we consciously register the impacts of this messaging, we are regularly bombarded with information regarding the types of people who work in science, technology, engineering, and mathematics (STEM). From television shows and movies to websites, news articles, and advertisements, the media recurrently conveys images of who does science, more often than not showcasing a relatively narrow view of science and scientists. Setting the media aside, perhaps we need look no further than our own classrooms to understand the ways scientists are portrayed. Many students are likely to get their earliest and most direct experiences with “real” scientists when attending college STEM classes—classes taught by a mostly white, mostly male faculty nationwide (National Science Foundation, 2013). Our textbooks, in the very rare instances they connect content to discussions of specific scientists, can tend to focus the most attention on individuals matching common scientist stereotypes (e.g., Darwin and Mendel in Reece et al., 2014). Even our classrooms themselves may, through their physical layouts and decorations, convey messages regarding who can participate in STEM (Cheryan et al., 2009). We might wonder, then, what are the impacts of these recurrent messages on students enrolled in postsecondary STEM classes, particularly in the increasingly diverse classroom environments of the United States? And what, if anything, might faculty do in response to this messaging? The messages we convey to students, either intentionally or unintentionally, regarding who does science can influence students’ stereotypes of scientists. Many lines of evidence point to the importance of these stereotypes in shaping students’ sense of belonging in STEM, with implications for persistence and success in STEM programs. For example, stereotypical representations of scientists in the media (Tanner, 2009; Cheryan et al., 2013; DeWitt et al., 2013; Martin, 2015) and in classroom decorations (Cheryan et al., 2009) have the potential to reduce interest in STEM fields among women and people of color. On the other hand, a variety of studies suggest students are more likely to pursue majors and careers in STEM if they agree with certain “positive” stereotypes of scientists (Beardslee and O’Dowd, 1961; Wyer, 2003; Schneider, 2010). Our own work further suggests that holding counterstereotypical images of scientists might be an important factor in predicting success in science classes (Schinske et al., 2015). These findings illustrate the importance of science identity, a sense of belonging, and stereotype threat in determining persistence and success in STEM classes. Identity refers to the extent to which we view ourselves as a particular “kind of person” (Gee, 2000), with science identity more specifically referring to whether we see ourselves as scientists. If students hold stereotypes that portray scientists as a different “kind of person” than themselves, those students might conclude they are not “science people.” This mismatch between a student’s personal sense of identity and a science identity can hamper persistence in STEM (Seymour and Hewitt, 1997; Brickhouse et al., 2000). Harboring views of scientists that differ from students’ perceptions of themselves could also cause students to feel as though they do not belong in science. The extent to which students feel a sense of belonging similarly correlates with levels of achievement and motivation in school settings (Goodenow, 1993; Roeser et al., 1996). Feeling that one differs from stereotypical descriptions of people in a particular field of study can additionally hinder achievement in that field due to stereotype threat. Under stereotype threat, students harbor an often subconscious fear of confirming a negative stereotype about their groups (Steele, 1997). For example, students of color, women, and first-generation college students might fear confirming a stereotype that their groups are not good at science due to a perception that scientists are white men from privileged, highly educated backgrounds. This threat can undermine engagement and performance, even among students who are otherwise well qualified academically (Steele, 1997). Even subtle cues involving a lack of women or people of color visually represented in an academic environment or on a flyer can trigger dramatic reductions in interest and performance due to stereotype threat (Inzlicht and Ben-Zeev, 2000; Purdie-Vaughns et al., 2008). More specific to science contexts, stereotype threat has been described as a significant factor in predicting interest, persistence, and success in STEM majors, especially for women and students of color (Hill et al., 2010, chap. 3; Beasley and Fischer, 2012). Interventions that remove the conditions that trigger stereotype threat can reduce or even entirely eliminate achievement gaps between women and men or between students of color and white students in test scores and course grades (e.g., Steele and Aronson, 1995; Good et al., 2003; Cohen et al., 2006). What Can Faculty Do in STEM Classes to Broaden the Image of the Scientist? Given the evidence suggesting that stereotypes of scientists impact persistence and success in STEM, efforts to feature counterstereotypical images of scientists have the potential to narrow equity gaps and broaden participation in STEM. Stereotypes of scientists are malleable (Cheryan et al., 2015), and previous work suggests that providing counterstereotypical messaging could enhance interest and success in STEM among underserved populations of students (McIntyre et al., 2004; Steinke et al., 2009; Cheryan et al., 2013). One common strategy for introducing counterstereotypical images of scientists to students is to increase the prevalence and visibility of diverse STEM “role models”—individuals who students may choose to emulate. Marx and Roman (2002) describe how role models are chosen through “selective, social comparison whereby certain attributes are copied and others are excluded.” Because comparisons of social similarity may involve the visible personal characteristics of potential role models, many studies have focused on the potential benefits of gender- or race/ethnic-matched role models. For example, the presence of female role models has served to mitigate stereotype threat and boost math performance among female students (Marx and Roman, 2002; Marx and Ko, 2012). In terms of race/ethnicity, both white and nonwhite students tend to select race/ethnic-matched career role models (Karunanayake and Nauta, 2004), and having a race/ethnic-matched instructor role model has been shown to correlate with student success (Dee, 2004; Fairlie et al., 2011). While these results would suggest placing a priority on seeking out gender/race/ethnic-matched role models for STEM students, other studies have failed to find distinct benefits of role models who match students’ own races/ethnicities and genders (Ehrenberg et al., 1995; Maylor, 2009; Phelan, 2010). Perhaps explaining these discrepancies, Marx and Roman (2002) point out that the attributes important to seek in a role model will ultimately be those attributes of importance to the individual choosing the role model (e.g., the attributes considered important by students). Because social identities are informed by many different factors, and individuals have multiple identities that resonate in different contexts (Gee, 2000), it might be difficult to predict which role model attributes will be most important in encouraging students to form a science identity. Buck et al. (2008) provide guidance in this area in finding that students needed to identify someone “who cared about them and shared common interest/experiences” in order for role models to be effective. This work implies that faculty interested in enhancing students’ science identity and sense of belonging in STEM should, in addition to identifying diverse role models in terms of gender/race/ethnicity, place a priority on featuring individuals to whom students might personally relate, based on interests and experiences. The concept of “possible selves” might represent a more useful and precise way to think of counterstereotypical examples than does the concept of “role modeling.” Possible selves refer to everything that each of us “is tempted to call by the name of me” (James, 2005) or the set of “individually significant hopes, fears, and fantasies” that define oneself (Markus and Nurius, 1986). Individuals can reflect upon their own possible selves, and these possible selves are understood to influence motivation and future behavior (Markus and Nurius, 1986). Students weigh their possible selves in constructing school identities, and these interactions between possible selves and academic identities mediate the potency of stereotype threat (Steele, 1997; Oyserman et al., 2006). Possible selves more specifically play an important role in the development of a science identity (Hunter, 2010), and students’ “possible science selves” might help explain career choices in STEM (Steinke et al., 2009; Mills, 2014). Taken together, this implies students’ science identities and resistance to stereotype threat might be enhanced if they see their own their own possible selves reflected in STEM. This highlights a subtle but important difference between the concepts of role models and possible selves. Compared with featuring scientist role models that represent people students are expected to become more like, seeing one’s possible self in a scientist would involve seeing someone in science you already are like. Given the evidence that counterstereotypical perceptions of scientists are important in diverse science classrooms (Schinske et al., 2015) and that viewing one’s possible selves in science might enhance science identity (Hunter, 2010; Mills, 2014) and mitigate stereotype threat (Oyserman et al., 2006), we developed and evaluated a classroom intervention to introduce students to counterstereotypical examples of scientists. In evaluating the intervention, which we call “Scientist Spotlights” (see Methods), we sought to explore the following four hypotheses. Hypothesis 1: Scientist Spotlights will shift students’ descriptions of scientists toward nonstereotypical descriptions. Hypothesis 2: Scientist Spotlights will enhance students’ ability to see their possible selves in science by enhancing their ability to relate to scientists. Hypothesis 3: Shifts in scientist stereotypes and relatability of scientists will correlate with students’ interest in science. Hypothesis 4: Shifts in scientist stereotypes and relatability of scientists will correlate with course grades. Below we review the development of the Scientist Spotlight intervention, the study context, and our mixed-methods analysis of student essays and quantitative surveys to evaluate the intervention. Ben Barres is a Stanford professor of neurobiology. He studies diseases related to signaling in the nervous system, and in particular the roles of supporting cells around neurons. Dr. Barres is also a leader in science equity and the effort to address gender gaps. He is uniquely positioned to address these issues, since he has presented both as a female and a male scientist at different times in his career. View the Wall Street Journal article about Ben Barres by clicking here (Begley, 2006). What was most interesting or most confusing about the articles you read about Dr. Barres? What can you learn about neuron signaling (action potentials, synapses, supporting cells) from these articles? What do these articles tell you about the types of people that do science? What new questions do you have after reviewing these articles? The above example was assigned before a unit on neuron signaling and therefore assisted in the introduction of content in that area. The writing prompts were aimed at creating opportunities for metacognition (Tanner, 2012). Prompts changed slightly from one assignment to the next, but the third prompt about the “types of people that do science” was always included. A photograph of the featured scientist was also included with each assignment. Students submitted responses to Scientist Spotlights through an online course-management system (Moodle), and submissions were scored only for timeliness and word count. We used a quasi-experimental, nonequivalent-groups design (Shadish et al., 2002; Trochim, 2006) to evaluate Scientist Spotlights in a Human Biology course at a diverse community college during the Fall 2013–Fall 2015 academic terms. Human Biology is a one-quarter lecture/lab general education course open to any student, but targeting transfer students and those with interests in human health careers. Students in five sections of Human Biology during that time period completed Scientist Spotlights on a weekly basis (hereafter “Scientist Spotlight Homework” students). Each Scientist Spotlight was worth 10 points, so the assignments (n = 10) contributed a total of 100 points to the final course grade (865 points in the whole course). Efforts were made to attend to multiple axes of diversity when selecting scientists to feature, with special attention to the racial/ethnic diversity of students in these classes. Half of the weeks featured female scientists and seven out of 10 weeks featured at least one nonwhite scientist. Occasionally, more than one scientist was featured during a Scientist Spotlight assignment. Selected scientists represented diverse socioeconomic backgrounds, gender identities, interests outside science, paths to careers in science, temperaments, ages, sexual orientations, and countries of origin. Supplemental Material, part A, lists the names of individuals featured in Scientist Spotlights during this study. The full set of 10 Scientist Spotlight assignments, including readings and resources, is available by request to the corresponding author. During the same time period, students in two sections of Human Biology did not perform Scientist Spotlights. Instead, those students completed comparable metacognitive online assignments (example in Supplemental Material, part B) based on popular science articles and journal articles compiled in a course reader (hereafter “Course Reader Homework” students). Although no explicit instruction regarding scientist stereotypes took place in these classes, three scientists were briefly discussed during lecture presentations. An African-American female scientist (Jewel Plummer Cobb), a white male scientist (Neil Shubin), and a Japanese male scientist (Masayasu Kojima) were all mentioned during class while highlighting certain research findings related to course content. Students saw photographs of all three scientists and watched brief videos featuring Dr. Cobb and Dr. Shubin but did not perform any individual/group work or metacognitive activities surrounding these scientists. Quasi-experimental approaches, by definition, lack randomization in assigning participants to groups (Shadish et al., 2002; Trochim, 2006). As such, students self-selected into Human Biology course sections and the instructor (J.N.S.) 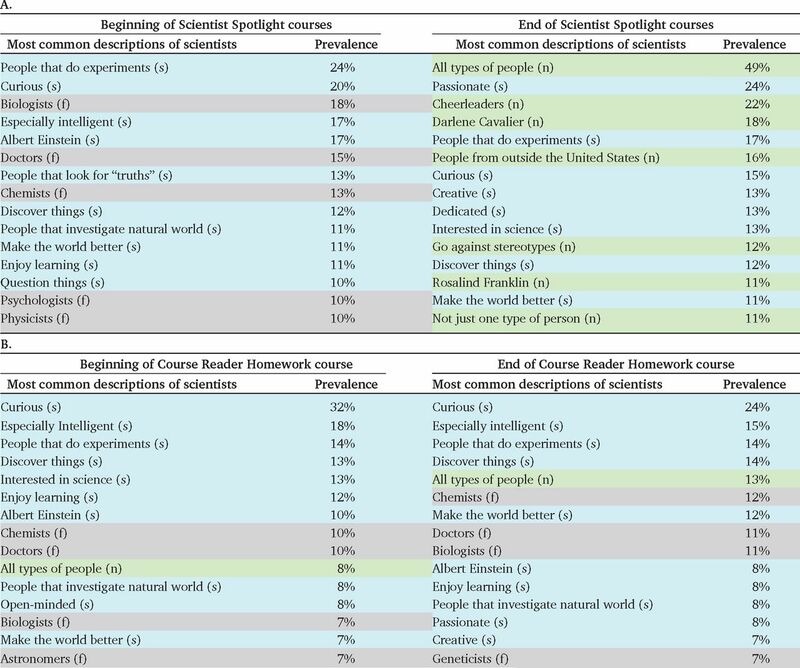 selected sections in which to implement Scientist Spotlight versus Course Reader Homework. While nonrandom assignment to groups can limit researchers’ ability to infer causal connections between interventions and outcomes, quasi-experimental approaches can still provide robust and valuable insights and offer advantages over randomized experiments in certain contexts (Shadish et al., 2002). We attempted to ensure as much equivalence as possible between groups in that all classes adhered to the same curricular expectations, were taught at similar times of the day in similarly arranged classrooms, and used the same types of in-class activities. The same faculty member (J.N.S.) served as instructor for all of the course sections involved in this study, though one Course Reader Homework section was cotaught by another faculty member. We controlled for various student-level differences between groups during statistical analyses and used these “weighted means” in evaluating our hypotheses (see Methods and Supplemental Material, part E). It should be noted that, in the analyses that follow, we consider students as the experimental units. This was considered most appropriate in this instance, because Scientist Spotlights were designed to interact with individual students in different ways, raising interest in students as individual observations. We do, however, control for course section in analyses to account for trends based on grouping at the class level. This work was conducted at a large (∼22,000 students) California community college that is a designated Asian American and Native American Pacific Islander–Serving Institution (AANAPISI). The majority (59%) of students come from low-socioeconomic status (low-SES) families and the majority (66.2%) indicate the educational goal of transferring to a 4-year institution. Approximately 20% of Human Biology students state the intention of majoring in biology. Forty-six percent of students report that Human Biology is the first college science class they have taken, and 13% of students report that Human Biology is the first science class they have ever taken at any level. A total of 364 students initially enrolled in the five sections of Human Biology that completed Scientist Spotlight Homework (x = 73 students per class). One hundred thirty-nine students initially enrolled in the Course Reader Homework sections (x = 70 students per class). However, 26 students from Scientist Spotlight Homework classes and 13 students from Course Reader Homework classes dropped the course within the first 2 weeks of class, leaving 338 students as the final enrollment for Scientist Spotlight Homework sections and 126 students in Course Reader Homework sections. The table in the Supplemental Material, part C, compares the demographic characteristics of students in these classes. We defined “underserved” racial/ethnic groups as those groups that have persistently entered STEM majors at lower rates compared with their prevalence on campus and experienced comparatively lower success rates in STEM classes. This included students identifying as Latino/a, Black, Native American, Filipino/a, Pacific Islander, and Southeast Asian (e.g., Vietnamese, Laotian, Cambodian, Indonesian). The majority of Scientist Spotlight and Course Reader Homework students identify as members of underserved groups (Supplemental Material, part C). Students in these Human Biology classes identified 25 different first languages spoken, with English, Spanish, and Vietnamese representing the most common first languages spoken. In evaluating Scientist Spotlights, we used a mixed-methods approach in which we reviewed short-essay responses from students for context and themes and then coded student responses into categories for quantitative analysis. Two essay prompts were used. The first prompt was designed to address hypothesis 1 by eliciting students’ stereotypes of scientists. This prompt read, “Based on what you know now, describe the types of people that do science. If possible, refer to specific scientists and what they tell you about the types of people that do science” (hereafter “stereotypes prompt”). This prompt was described and its validity was explored by Schinske et al. (2015). The second prompt was developed as an exploratory method for assessing students’ possible selves in science. That is, assessing whether students perceived scientists as reflecting their possible selves, and if so, what aspects of themselves they saw reflected in scientists (hypothesis 2). We chose to approach this topic by surveying the extent to which students could “personally relate” to scientists. The prompt consisted of the challenge statement: “I know of one or more important scientist to whom I can personally relate,” followed by a Likert scale including “agree,” “somewhat agree,” “somewhat disagree,” “disagree,” and “I don’t know.” Following the Likert scale, students were instructed: “Please explain your opinion of the statement” (hereafter “relatability prompt”). This prompt was developed and face validity was established through multiple quarters of testing in class and informal talk-aloud trials with students. Even though an “I don’t know” response was essentially the same as “disagree” when students responded whether they knew of one or more relatable scientists (see also Results), we found it important to include an “I don’t know” option. Some students were more comfortable circling “I don’t know” than “disagree,” which sounded like a “wrong” answer to them. These two prompts were printed on one side of a sheet of paper, so students had approximately half a sheet to respond to each prompt. J.N.S. provided the surveys to students on the first and last days of each Human Biology course, telling students, “I am very interested in students’ ideas about science and scientists, so I appreciate you taking 5–10 min to respond to these prompts. There are absolutely no right or wrong answers and there’s nothing I would like more than to see many different thoughts on the topic. Your responses will not be graded and will not be reviewed in connection with your name.” Though responses were not graded, students received five points (out of 865 course points) for participating and completing surveys. When looking for shifts in attitudes about scientists in these surveys, only papers from students who submitted both beginning- and end-of-course responses were considered. As preliminary results suggested students in Scientist Spotlight Homework classes were adopting new attitudes regarding scientist stereotypes and the relatability of scientists, we were interested in whether those shifts would be maintained over time. To assess these shifts longitudinally, J.N.S. sent an online survey that included the stereotypes and relatability prompts to Scientist Spotlight Homework students approximately 6 months after the end of class. We anonymized and randomized student papers and followed the procedures of Schinske et al. (2015) to categorize responses to the stereotypes prompt. While reviewing student responses, we recorded the words, phrases, and names students used to describe scientists, and tallied the frequencies of those descriptions among the papers. Exemplar quotes were selected to represent the most common themes and provide context. Pseudonyms were used in place of student names to protect anonymity. Students’ descriptions of scientists were then coded as Stereotypes, Nonstereotypes, or Fields of Science. Following our previous work (Schinske et al., 2015), we defined Stereotypes as any widely represented descriptions of scientists matching stereotypes uncovered by Mead and Metraux (1957). Nonstereotypes included less commonly used descriptions of scientists not reported in that previous work. Fields of Science included names of science fields or career types (e.g., biologist). We previously demonstrated that independent reviewers reliably code descriptions as Stereotypes (0.86 interrater correlation) and Nonstereotypes (0.89 interrater correlation; Schinske et al., 2015). We recorded the number of descriptions from each category for each student, then converted those numbers into percentages out of total comments (e.g., percent of Stereotypes out of all comments) to partly control for differences in the lengths of responses between students. Changes in the proportions of Stereotypes and Nonstereotypes were analyzed using repeated-measure analysis of covariance (RM-ANCOVA). Proportions of Stereotypes/Nonstereotypes acted as dependent variables, with time (beginning vs. end of course) and treatment (Scientist Spotlight Homework vs. Course Reader Homework) input as between-subjects factors. Gender, race/ethnicity (categorized as traditionally underserved vs. traditionally well served), and course section were used as covariates. We reviewed short-essay responses to the relatability prompt and transcribed each of students’ statements (e.g., “Don’t know any scientists,” “Relate to musician scientist,” “Relate to Rosalind Franklin”) into the top of a spreadsheet. As those statements reappeared in subsequent papers, we tallied the appearance of the statements in the spreadsheet. Exemplar quotes were selected to represent the most common themes and provide context for why students could or could not personally relate to scientists. Changes in students’ relatability Likert-scale selections from the beginning to the end of the course, were analyzed using RM-ANCOVAs. Relatability Likert scores acted as the dependent variables, with time and treatment input as between-subjects factors. Gender, race/ethnicity, and course section were used as covariates. The exploration of hypothesis 3 required comparing shifts in students’ stereotypes of scientists and ability to relate to scientists to shifts in science interest. To monitor student interest, during the first and the last weeks of class, students completed an online survey (Supplemental Material, part D). The survey included eight quantitative items adapted from the Student Assessment of their Learning Gains Survey (Seymour et al., 2000), which were reshaped into the “Science Interest” scale. Students responded to prompts such as “Presently I am enthusiastic about this subject” on a five-point Likert scale, ranging from “not at all” to “a great deal.” Supplemental Material, parts G and H, provide details regarding how the Science Interest scale was derived from these items. In separate questions, students indicated whether they were majoring in biology or another STEM field and whether they had taken previous science classes (Supplemental Material, part D). As we also wished to look for interactions involving student demographics, the final page of the surveys asked students to identify their gender and racial/ethnic identities and first spoken language. Students received five participation points (out of 865 course points) for completing these quantitative surveys. Prior work suggested broader student outcomes, like grades and interest in science, relate to holding nonstereotypical views of scientists (Schinske et al., 2015) and developing possible science selves (Steinke et al., 2009; Mills, 2014). We therefore created categorical variables to distinguish students who exhibited these characteristics. Specifically, we compared end-of-course with beginning-of-course values to categorize students as either decreasing versus not decreasing in their proportion of Stereotypes, increasing versus not increasing in their proportion of Nonstereotypes, and increasing versus not increasing in relatability. The relationships between each of these categorical variables and Science Interest were tested in a 2 × 2 × 2 (categorical variable × stereotype change × time) RM-ANCOVA controlling for gender, race/ethnicity, course section, and past science class experience. Students’ course grades, expressed numerically (“A” = 4, “B” = 3, etc. ), were included in analyses to explore correlations between Stereotypes, Nonstereotypes, relatability, and in-class achievement. As in tests for correlations involving interest in science, we used the categorical variables we generated for changes in Stereotypes, Nonstereotypes, and relatability in ANCOVAs to explore connections between those variables and course grades. These analyses controlled for gender, race/ethnicity, course section, and past science class experience. All statistical analyses were performed in SPSS (SPSS for Windows, 19.0.0, IBM, Armonk, NY). To enhance clarity and readability, we present descriptive statistics and ANCOVA tables from our analyses in the Supplemental Material, parts E and F, rather than in the body of the article. Shading and letters in parentheses denote categories of descriptions per Schinske et al., 2015: s/turquoise = Stereotype; n/light green = Nonstereotype; f/gray = Field of Science. The above responses made the argument that many different types of people, and perhaps all types of people, are scientists. Indeed, at the end of the course, the majority of students (55%) included descriptions of scientists fitting into at least one of the following categories: all types of people, not just one type of person, or go against stereotypes. The quotations from Cynthia and Matthew further demonstrated that, at the end of the course, many students had specific, counterstereotypical individuals in mind to inform their descriptions of scientists. Matthew and Felipe pointed out that many scientists did not have an innate or early interest in science, and we no longer see references to scientists as especially intelligent in these exemplars. Given that we believe all of the scientists featured in Scientist Spotlights are very intelligent, we found it striking that “intelligent” and “smart” largely disappeared as ways to describe scientists (Table 1A). It appears that, while the featured scientists may still have been impressively smart, “intelligent” was no longer a significant defining feature of scientists in students’ minds. Rather, scientists were considered regular/normal people who happened to find their way to careers in science (responses of Matthew, Felipe, and Tania). Theresa and some other Course Reader Homework students did mention at the end of the course that all types of people do science, causing that description to increase in prevalence (Table 1B). It is interesting to note, however, that the remainder of Theresa’s end-of-course response was nearly identical to her beginning-of-course response—emphasizing curiosity and raising the same example of Albert Einstein. In other words, while a small number of Course Reader Homework students appear by the end of the course to be describing a more inclusive version of who does science, those students’ responses still lacked the specific examples and expanded descriptions of scientists we observed from Scientist Spotlight students. In quantitatively analyzing these trends, an RM-ANCOVA revealed significant interactions between treatment and the use of Stereotypes, F(1,311) = 13.39, p < 0.001, η2 = 0.04, and Nonstereotypes, F(1,311) = 16.51, p < 0.001, η2 = 0.05. When looking solely at raw means, we observed all students using fewer Stereotypes at posttest, but Scientist Spotlight Homework students showed a sharper decrease, suggesting that the treatment produced a stronger decrease in Stereotype use. However, an analysis of weighted means to isolate the variability introduced by treatment condition from the variability introduced by race/ethnicity, gender, and course section, showed no significant differences in the decrease across groups. 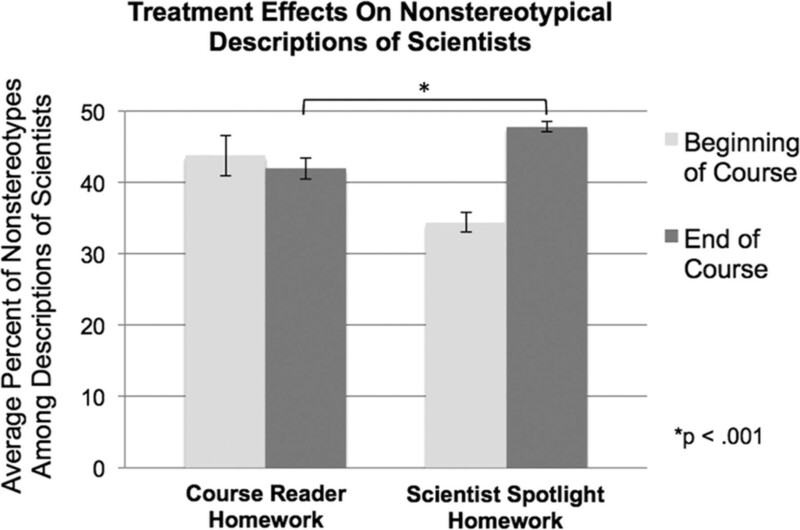 In terms of Nonstereotypes, both raw and weighted means show a significant increase among Scientist Spotlight students when compared with Course Reader Homework students (Figure 1 and Supplemental Material, parts E and F). Therefore, when controlling for unequal group sizes and nonrandom assignment, our results suggested the completion of Scientist Spotlights was associated with increases in the use of Nonstereotypes in describing scientists. Figure 1. Average percent of Nonstereotypes among descriptions of scientists at the beginning vs. end of the course for Course Reader Homework and Scientist Spotlight Homework classes. Graphs depict weighted means to control for unequal group sizes and nonrandom assignment of students to treatment. Error bars represent SE. Beginning- and end-of-course responses to the relatability prompt additionally demonstrated distinct shifts in an ability to personally relate to scientists. Two hundred eight Scientist Spotlight Homework students and 86 Course Reader Homework students submitted both beginning- and end-of-course responses to the relatability prompt. The sample size for this prompt was smaller than that for the stereotypes prompt, since it took longer to develop and establish face validity for this prompt. As a result, it was only presented at both time points to four of the five sections of Scientist Spotlight students. The final relatability prompt stated: “I know of one or more important scientist to whom I can personally relate,” which was followed by a Likert scale and a space for qualitatively explaining the opinion selected. An “I don’t know” option was included in the Likert scale and was coded as “Disagree” based on the qualitative explanations provided by students selecting “I don’t know” (e.g., “I honestly only know of one [scientist] and I’m nothing like him”). This presented a barrier to finding scientists relatable, even when recognizing the featured scientists were very diverse. On the other hand, notable shifts in qualitative responses toward an increased ability to relate to scientists were sometimes observed even among students whose Likert-scale relatability selections did not change (e.g., Yvette, who selected “somewhat agree” at both the beginning and end of the course). Responses reiterated beginning-of-course themes that most students could not relate to, and did not even know of, any scientists. This was in spite of the fact that some scientists were introduced as part of certain lectures during Course Reader Homework classes (see Methods). Following an RM-ANCOVA, we observed an interaction between treatment × time for relatability Likert-scale ratings on the relatability prompt, F(1,276) = 8.49, p = 0.004, η2 = 0.03. Course Reader Homework students’ end-of-course relatability Likert scores did not differ significantly from their beginning-of-course scores, while Scientist Spotlight students’ end-of-course relatability scores were significantly higher than both their own beginning-of-course scores and Course Reader Homework participants’ end-of-course scores (Figure 2 and Supplemental Material, parts E and F). Quantitative results therefore support the hypothesis that Scientist Spotlights increase students’ sense of relating to scientists. Figure 2. Average relatability Likert-scale selections by students at the beginning vs. end of the course for Scientist Spotlight Homework and Course Reader Homework classes. Graphs depict weighted means to control for unequal group sizes and nonrandom assignment of students to treatment. Error bars represent SE. Fifty-seven Scientist Spotlight Homework students submitted a response to the stereotypes prompt 6 months after the end of their courses (17% response rate). Of those, 47 had submitted responses to the stereotypes prompt at all three time points (beginning of term, end of term, 6 months after class). Fifty-two students submitted a response to the relatability prompt 6 months after the end of their courses (15% response rate). Of those, 27 had submitted responses to the relatability prompt at all three time points. As the community college student population is in constant flux, with students transferring to 4-year schools or professional programs, moving between colleges, and entering and exiting school at various times due to work and family obligations, we were not surprised by the modest response rate to a survey 6 months after the end of class. In spite of these lower sample sizes, however, this 6-month follow-up subsample appeared to match the larger sample in terms of demographics. Three independent t tests for gender, race/ethnicity (traditionally underserved vs. traditionally well served), and condition demonstrated that gender, t(279) = −0.655, p = 0.513, and race/ethnicity, t(69.87) = 0.908, p = 0.367, were similar between the 6-month follow-up sample and the larger, original sample. Six months after the end of class, students appear to have maintained the largely nonstereotypical ideas about scientists they displayed at the end of the course. Table 2 shows the most prevalent themes found in responses to the stereotypes prompt from students who submitted essays at all three time points. We additionally created word clouds to visually convey the full range of scientist descriptions at each time point (Supplemental Material, part I). Descriptions of scientists as representing many/all types of people remained the most common theme in the 6-month postclass responses. Students additionally continued to describe scientists as individuals who defy stereotypes, and the idea that scientists have “special intelligence” continued to be relatively rare. Fifty-seven percent of students included descriptions of scientists fitting into at least one of the following categories 6 months after the course: all types of people, not just one type of person, and go against stereotypes. Three-way RM-ANCOVAs controlling for gender and race/ethnicity (Supplemental Material, parts E and F) showed that stereotypical descriptions dropped significantly at the end of the course and remained low 6 months later, F(2,78) = 4.36, p = 0.016, η2 = 0.10 (Figure 3a). Nonstereotypical descriptions increased significantly at the end of the course and remained high 6 months later, F(2,80) = 5.97, p = 0.004, η2 = 0.13 (Figure 3b). Relatability similarly increased at the end of the course and remained high 6 months later, though in this case the initial increase was detected at a p value of 0.083, F(2,46) = 2.63, p = 0.083, η2 = 0.10 (Figure 3c). This was likely because of the smaller sample size available for the relatability prompt. Figure 3. Average percent of Stereotypes (a), percent of Nonstereo­types (b), and relatability Likert-scale selections (c) in Scientist Spotlight students’ responses at the beginning of the course, end of the course, and 6 months following the end of the course. Error bars represent SE. We calculated both beginning- and end-of-course Science Interest scores (Supplemental Material, parts G and H) for each student. To test the relationship between shifts in Science Interest and shifts toward majoring in STEM fields, we conducted a 2 × 2 (Science Interest × STEM major interest) RM-ANCOVA controlling for gender, race/ethnicity, course section, and prior science class experience. Values for STEM major interest came from the online survey item “I am majoring or plan on majoring in another Science or Math field” (Supplemental Material, part D). A significant interaction for Science Interest was found, F(1,216) = 10.39, p = 0.001, η2 = 0.05, in which students whose Science Interest decreased or held steady showed a significant decrease in STEM major interest from pretest (x = 3.70, SE = 0.16) to posttest (x = 3.43, SE = 0.18), while students whose Science Interest increased reported more STEM major interest at posttest (x = 3.34, SE = 0.16) than at pretest (x = 3.74, SE = 0.18). RM-ANCOVAs using the Science Interest scale (Supplemental Material, parts E and F) revealed that a decrease in the use of Stereotypes correlated with higher Science Interest at the end of the course, F(1,182) = 4.46, p = 0.036, η2 = 0.02 (Figure 4a). We found a similar relationship between an increase in the use of Nonstereotypes and Science Interest that approached significance, F(1,182) = 3.32, p = 0.070, η2 = 0.02 (Figure 4b). Science Interest additionally appeared to increase from beginning of course (x = 3.287, SE = 0.076) to end of course (x = 3.568, SE = 0.061) for students whose ability to relate to scientists increased, but this finding did not achieve statistical significance, F(1,184) = 2.10, p = 0.149, η2 = 0.01. In total, these results provide partial support for the hypothesized relationship between shifts in scientist stereotypes/relatability and an interest in science/STEM majors. Figure 4. 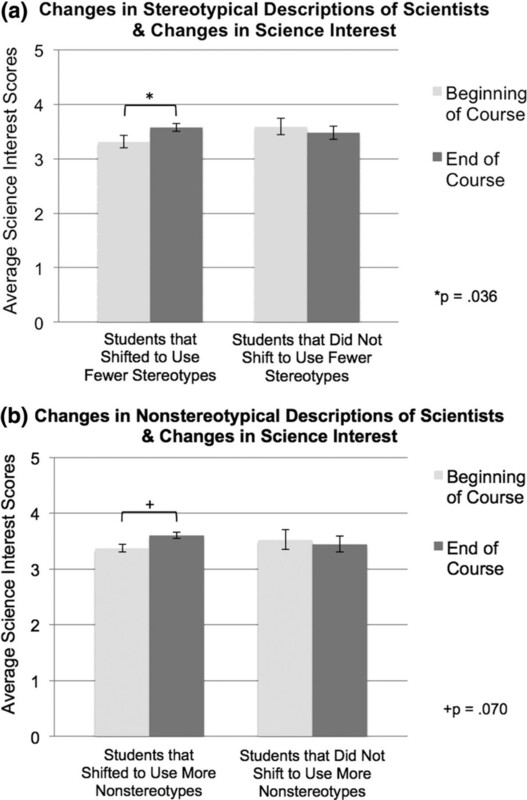 Relationships between changes in Stereotypes (a) and Nonstereotypes (b) to changes in Science Interest from the beginning of the course to the end of the course. As a first step, we tested whether the treatment had an effect on course grades. A one-way ANCOVA, controlling for gender, race/ethnicity, course section, and previous science class experience, revealed that Scientist Spotlight Homework students earned significantly higher grades than Course Reader Homework students, F(1,279) = 6.68, p = 0.018, η2 = 0.02 (Figure 5a and Supplemental Material, parts E and F). Figure 5. Average course grades (0 = “F,” 4 = “A”) for Scientist Spotlight Homework students vs. 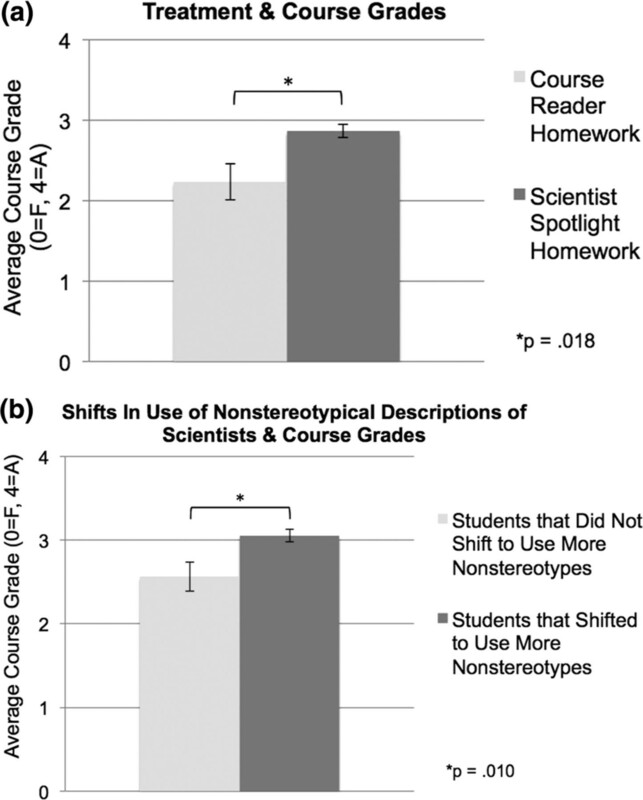 Course Reader Homework students (a) and for students whose proportion of Nonstereotype descriptions of scientists increased vs. did not increase (b). Error bars represent SE. Additional analyses were limited to Scientist Spotlight Homework students to prevent confounds introduced by the treatment. One-way ANCOVAs suggested there was not a significant effect for the use of Stereotypes on grades, F(1,211) = 3.00, p = 0.085, η2 = 0.01, but there was a significant effect of Nonstereotypes, F(1,211) = 6.68, p = 0.010, η2 = 0.03. Students whose use of Nonstereotypes increased earned significantly higher course grades than those whose use of Nonstereotypes held steady or decreased (Figure 5b and Supplemental Material, parts E and F). To test the relationship between relatability and course grade, we compared students whose relatability ratings increased, those whose relatability ratings decreased, and those whose ratings held steady. A one-way ANCOVA controlling for race/ethnicity, gender, course section, and science experience, suggested the grades of students whose ratings decreased (x = 2.59, SE = 0.24) were lower than students whose ratings held steady (x = 2.79, SE = 0.15) or increased (x = 3.01, SE = 0.10). However, the difference between groups was not significant, F(1,171) = 1.65, p = 0.195, η2 = 0.02. The finding of a correlation between an increase in Nonstereotypes and course grades therefore provided partial support for hypothesis 4. Many reports have documented the shortfall in students graduating with STEM degrees in the United States and the urgent need to recruit a more diverse STEM workforce (National Academy of Sciences, 2007, 2011). Interventions with the potential to enhance students’ science identities and reduce stereotype threat could prove valuable in promoting interest and success in STEM (Seymour and Hewitt, 1997; Brickhouse et al., 2000; Hill et al., 2010, chap. 3; Beasley and Fischer, 2012). We developed and tested an intervention in the form of weekly homework assignments that were aimed at allowing students to see their possible selves in science and promoting counterstereotypical examples of who does science. In the following sections, we discuss the utility of Scientist Spotlights in light of our findings, factors that may influence the effectiveness of Scientist Spotlights, and our anticipated future directions in exploring Scientist Spotlights. We used the stereotypes prompt to evaluate the impact of Scientist Spotlights on students’ stereotypes of scientists. When compared with a class performing a similar activity that lacked connections with diverse scientists, students who completed Scientist Spotlights adopted more nonstereotypical views of scientists (Figure 1). These changes appeared to be sustained 6 months after the courses ended (Figure 3) and were associated with higher course grades (Figure 5). Reductions in stereotypical descriptions of scientists further correlated with increases in Science Interest (Figure 4a) and an enhanced interest in STEM majors. We piloted the relatability prompt as a tool for examining students’ possible selves in a science context, making the case that explicitly asking students about their ability to personally relate to scientists would draw out descriptions of students’ possible selves in relation to scientists. While only 43% of Course Reader Homework students found scientists relatable at the end of the course, the vast majority (79%) of Scientist Spotlight students did (Figures 2 and 4c). These students discussed shared personalities and interests outside science as reasons for being able to relate to scientists, with some students also commenting on certain scientists’ nontraditional paths to gaining an interest in science. Many students used specific language such as “like me” or “I am also …” when describing why common interests or personal qualities caused them to relate to scientists after Scientist Spotlights. This suggested the relatability prompt might have functioned as intended in creating opportunities for students to reflect on their possible science selves. These findings suggest Scientist Spotlights hold promise as a tool for enhancing students’ possible science selves and disrupting stereotypes of scientists in diverse classroom settings. Prior studies point to the importance of these shifts in forming a science identity, mitigating stereotype threat, and enhancing student interest and success (Steele, 1997; Oyserman et al., 2006; Steinke et al., 2009; Hill et al., 2010, chap. 3; Hunter, 2010; Beasley and Fischer, 2012; Mills, 2014). Faculty might feel particularly wary of adopting new activities that overtly approach issues related to race and diversity due to a lack of training in how to facilitate discussions in those areas (Sue et al., 2009). STEM faculty commonly cite course content expectations and concerns regarding time as barriers to implementing innovative teaching strategies (Henderson and Dancy, 2007; Austin, 2011). Scientist Spotlights offer faculty an approach for openly addressing diversity in STEM classes while supporting content goals and requiring little grading or class time. Because Scientist Spotlights are assigned as homework and are graded based on timeliness and word count, the activities consume only a negligible amount of instructor time during and outside of class. This is perhaps particularly the case when they are assigned through an online course management system that automatically displays word counts. After an initial investment of time to identify scientists to feature and compose assignment prompts, Scientist Spotlights become an easily sustainable class activity. Additionally, by connecting diversity themes to course content through Scientist Spotlights, faculty are able to structure some of students’ content learning outside class. In this way, Scientist Spotlights assist faculty in meeting their content expectations, rather than taking time away from addressing content. This follows the best practices discussed by Chamany et al. (2008), who recommend “strategically embedding social context into those topics that are traditionally reviewed in … biology courses.” Highlighting the struggles and inequities experienced by scientists like Ben Barres also opened up opportunities for students to engage with issues of social justice in science. Infusing course content with themes of equity and social justice has been promoted as a particularly impactful way to engage traditionally underserved and underprivileged populations of students in STEM (Chamany, 2006; Chamany et al., 2008). At the same time, these themes of equity and diversity were clearly contextualized within instructors’ comfort zone of course content, which might allay instructor reservations about raising such themes as part of a STEM class. We predict that the strongest case for faculty adoption of Scientist Spotlights, and eventually adoption of more extensive diversity-related activities, might come from students themselves once faculty pilot Scientist Spotlights. Students in our sample responded so immediately and effusively to Scientist Spotlights, it appeared there was a great, unmet demand among students to approach science content through this lens. We predict that, if faculty see responses from their own students similar to those shown here, they will feel energized and empowered to become more deeply involved in addressing diversity. Scientist Spotlights might therefore represent an excellent introductory tool that could inspire further work on equity and diversity in STEM by science faculty. While Scientist Spotlights are relatively simple activities, successfully implementing them in a course likely depends in part on how an instructor chooses scientists to feature, writes the assignment prompts, introduces the assignments to the class, and reports back on students’ submissions. In the following sections, we elucidate some of the factors we feel assisted in achieving positive outcomes and reducing the potential for student resistance. We found the concept of possible selves to be helpful in identifying scientists to feature. Rather than looking for scientists to serve as role models that students should emulate, we sought out scientists with whom students might already have similarities; that is, scientists in whom students might see their possible selves. While gender/race/ethnic matching was important for some students, students more often cited shared personal qualities and outside interests as ways in which they saw themselves in scientists. Given that Human Biology primarily serves non–biology majors, it is not surprising that students also appreciated that not all scientists aspired to a science career at a young age and sometimes found science later in life. In consideration of the above, it is important to identify scientists for whom some sort of engaging biographical resource exists. It was in those biographical resources that students most directly encountered counterstereotypical information about scientists and found information that reminded students of themselves. We optimally hoped to find TED Talks, interviews, or podcasts featuring scientists telling their own stories in their own voices. However, we sometimes used printed interviews and biographical information, as in the example regarding Ben Barres (see Methods). The Story Collider (www.storycollider.org/podcasts) proved a particularly rich resource for identifying biographical information regarding counterstereotypical scientists. The Story Collider website includes hundreds of 10- to 20-min-long, often funny or emotionally stirring autobiographical stories told by diverse scientists. The podcast descriptions can be searched for certain key terms through the website, which can be helpful in identifying scientists working in areas connected with course content. In terms of the assignment prompt itself and the regularity of the assignments, our work suggests that performing Scientist Spotlights regularly and including a metacognitive question about who does science assisted in achieving the outcomes we observed. Course Reader Homework classes included three references to scientists working in the fields being studied in class (see Methods). Two of those scientists identified as people of color and all three had counterstereotypical qualities. Students were introduced to those scientists during class, saw pictures of the scientists, and watched short videos featuring two of the scientists. However, students did not engage in any individual or group activities regarding the scientists and were not asked to reflect on whether those segments of class impacted their views of scientists. Our results suggested these students did not substantially change their views of scientists. This suggests that going beyond simply mentioning/showing diverse scientists in class and moving to require regular work including metacognition about who does science might be key for stimulating larger changes in the ways students view scientists. Science faculty are increasingly aware that metacognition is necessary to drive lasting changes in students’ ideas and behaviors (Tanner, 2012). We therefore propose that the prompt reading, “What do these resources tell you about the types of people that do science?,” might be important to include in every Scientist Spotlight assignment, even if the other writing prompts vary from one assignment to the next. Alongside content expectations and time limitations, fear of student resistance represents another of the main barriers to the adoption of new teaching strategies by faculty (Henderson and Dancy, 2007; Seidel and Tanner, 2013). We encountered very little evidence of student resistance to completing Scientist Spotlights in these classes. Students completed Scientist Spotlights at very high rates, earned high scores, and seemed to find the assignments engaging and helpful. Students’ acceptance of Scientist Spotlights might partially relate to the flexibility students had to engage with either the course content part of the activity or the scientist biography part of the activity. Students were allowed to independently determine how much of their submissions focused on the “types of people that do science” prompt compared with the course content−related prompts. In this way, students could settle into their own comfort zones of discussing issues of content versus issues of diversity and scientist stereotypes. The non–content language instructors use to frame new activities and debrief completed activities (“instructor talk”) might additionally play a large role in reducing student resistance and creating effective environments for applying innovative strategies (Seidel et al., 2015). While Scientist Spotlights are largely out-of-class activities, J.N.S. spent a small amount of class time at the start of the course establishing a classroom culture conducive to performing Scientist Spotlights and explaining his pedagogical decision to use these assignments. Specifically, he made clear his reasons for incorporating Scientist Spotlights into the course and his goals for the assignments, expressed that there were no “right” or “wrong” ways to respond, and noted that students could write about whatever parts of the assignments resonated most strongly with them each week. They need not strictly respond to each assignment prompt in equal amounts or in the order shown. Following the first and second Spotlights, J.N.S. spent ∼5 minutes in class sharing anonymous student quotes to demonstrate how different students engaged with course content and reflected on their notions of scientists through the assignments. J.N.S. especially looked for quotes similar to Gina’s (discussed earlier) demonstrating the importance of the types of people who do science to the types of scientific questions that get pursued. This showed students in their own words that diversity is necessary to ensure diverse scientific questions are addressed and that it is important to understand who does science when considering what currently is and is not known about the topics studied in class. While quasi-experimental studies can represent a robust means of addressing education research questions, it is critical to explore alternate explanations for outcomes that might stem from the lack of random assignment to quasi-experimental groups (Shadish et al., 2002). Though the course sections we studied were equivalent in many respects, they differed slightly in student demographics, timing during the year, and lecture location. It is possible, for example, that differences observed between Scientist Spotlight Homework and Course Reader Homework groups were influenced by slight variations in student racial/ethnic or gender identities between those groups. This would confound our ability to attribute differences to our intervention. Similar scenarios could be proposed for differences in lecture locations or timing during the year. However, all lecture rooms were similarly appointed and neither treatment group was isolated to a single part of the year. The five Scientist Spotlight courses took place throughout the year (three Fall classes, one Winter class, one Spring class), while one Course Reader Homework class took place in the Fall and the other in the Spring. Though differences between the courses appeared relatively subtle, we used statistical corrections to partition out variance introduced by demographics, course section differences, and the unequal sizes of quasi-experimental groups (i.e., lower number of Course Reader Homework students). The resulting “weighted means” were used in evaluating our hypotheses. These weighted means often differed substantially from means observed in our raw data (Supplemental Material, part E). This provided us more assurance that the differences we observed were due to the Scientist Spotlights but at the cost of variability that may have demonstrated a more robust effect. As a result, it might be argued that our results provide only conservative estimates of the impacts of Scientist Spotlights due to overly aggressive statistical corrections. That said, some researchers argue that statistical corrections are still insufficient to account for a lack of randomization, and issues with unequal group characteristics could confound the ability to make strong inferences (Shadish et al., 2002). Other differences between our quasi-experimental groups included drop/fail/withdrawal (DFW) rates and the fact that one Course Reader Homework group was cotaught with a second instructor. From our results, it is apparent that 72% of Scientist Spotlight Homework students submitted both a beginning- and end-of-course stereotypes prompt essay, but only 67% of Course Reader Homework students did so. 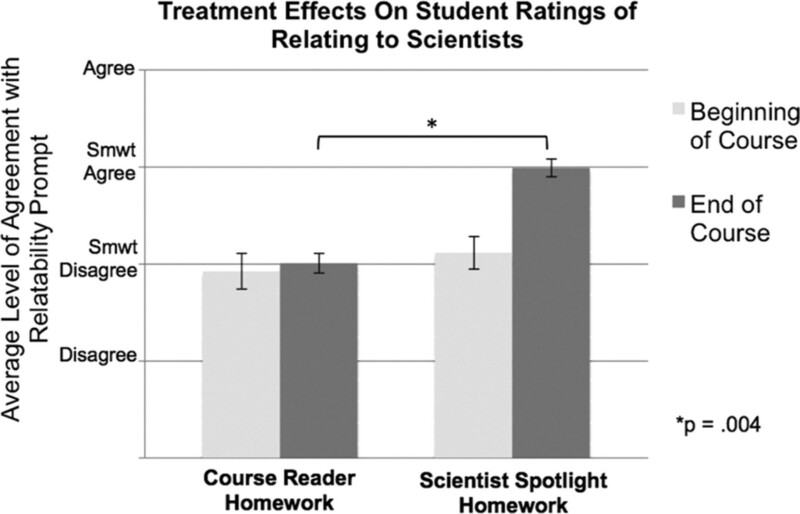 This might partially relate to differences in DFW rates between Scientist Spotlight and Course Reader Homework classes, effectively resulting in higher attrition in Course Reader Homework classes. Scientist Spotlight Homework classes had a 20% DFW rate compared with a 23% DFW rate in Course Reader Homework classes (for reference, the average DFW rate across all Human Biology classes at this college is 29%). It is also possible that Course Reader Homework students were less engaged in class, causing more of them to miss one of the days when a survey was scheduled. In either case, if the lower response rate among Course Reader Homework classes occurred disproportionately among students who shifted toward higher levels of Nonstereotypes/relatability, then attrition in those classes could partly account for differences observed between quasi-experimental groups. This scenario seems unlikely, however, given that our findings suggest students conveying higher levels of Nonstereotypes and relatability have increased success in class (Schinske et al., 2015; current study). It seems more likely that attrition could have masked larger differences between our groups by eliminating additional data points for Course Reader Homework students who did not shift in these variables. It is also possible that the addition of a coteacher for one Course Reader Homework section influenced these differences between groups as well as our results. However, J.N.S. maintained control over relevant course assignments in all sections, and the cotaught section was equivalent to the others in terms of its curriculum expectations and types of class activities. Further, we included course section as a covariate in analyses to control for course-level differences. While we observed significant variation in dependent variables among students, we did not observe such variation between course section groups. With regard to descriptions of scientists reported from student essays, our study did not seek to establish certain descriptions as “good” and others as “bad” in relation to enhancing success or interest in biology. While some studies have categorized certain scientist stereotypes as “positive” and “negative” (Mead and Metraux, 1957), we did not explore students’ cultural evaluations of specific stereotypes and cannot conclude whether individual students view such associations positively or negatively. Further surveys and interviews would be necessary to evaluate the deeper meanings and relative importance of various descriptions within the Stereotypes and Nonstereotypes categories. It should additionally be noted that our results do not provide specific insights regarding the mechanism(s) behind the outcomes observed surrounding Scientist Spotlights. Future work could explore the roles of metacognition, stereotype threat reduction, identification of possible selves, and other factors as mechanisms underlying these results. Other possible limitations involve our proposed assessment of students’ possible science selves and the nature of our survey activities more generally. We used the concept of “relatability” as a means of capturing possible selves, making the case that the prompt explicitly asked students about whether they could relate to a scientist they knew. This was an exploratory narrative approach, and whether it fully captures a student’s sense of their own potential talents and abilities as scientists is a question for further exploration. Our measure was also limited in its ability to capture how students thought of themselves in terms of the characteristics of scientists they named. A more precise measure of students’ sense of self-as-scientist could be helpful to expand upon and clarify the present findings. Finally, results presented in this paper might not be broadly generalizable to all school settings. Qualitative studies have the strength of more deeply exploring student ideas but can lack the generalizability of some quantitative studies (Johnson and Christensen, 2008, pp. 441–442). We conducted our study in the unique environment of a large, diverse community college in the San Francisco Bay Area. One might anticipate different results or student reactions in less diverse settings in different parts of the United States. The types of exemplar quotes we report and the frequencies of themes we observed in students’ essays, therefore, might be specific to our student population and teaching context. We envision multiple opportunities to extend this work in the future, ranging from further explorations of the present findings in Human Biology classes to dissemination of the intervention across new institutions and teaching contexts. In light of the limitations discussed in the previous section, pursuing study designs that match students to quasi-experimental groups or randomize participants could reveal further significant trends and more fully illuminate the impacts of the intervention. Assessing Scientist Spotlights in additional class contexts would assist in exploring the generalizability of our findings. We also believe further explorations of the relatability prompt and other measures that might evaluate students’ possible science selves could yield valuable insights into broadening participation in STEM. For example, while we observed intriguing trends connecting shifts in relatability to broader student outcomes, such as higher Science Interest and course grades, these trends did not achieve statistical significance. Further studies of relatability would assist in more fully illuminating its connections to these broader outcomes and clarifying its relationship to the broader concept of possible science selves. Future studies might additionally more directly explore the impacts of Scientist Spotlights on stereotype threat or classroom equity gaps. That certain shifts related to Scientist Spotlights correlated with increased Science Interest and higher course grades is encouraging and raises interesting questions about how students of different genders and races/ethnicities experienced these outcomes. However, our unequal group sizes and the nonrandom distribution of students among conditions prevented us from drawing conclusions along these lines. Further, the trends we observed in Science Interest were in relation to shifts in stereotypes/relatability, not treatment effects. Observing treatment effects related to Science Interest might require more robust controls and might be assisted by studies exploring students’ sense of themselves as scientists in relation to Science Interest. Additional longitudinal data would also assist in understanding the enduring impacts of Scientist Spotlights. Longer-term follow-up data from both Scientist Spotlight students and control students would allow us to investigate how sustained shifts in stereotypes and relatability correlate with motivation and behavior in the future, specifically as they relate to pursuing and persisting in STEM majors. Perhaps the most exciting extension of this work involves engaging additional faculty in the creation and deployment of Scientist Spotlights in new institutional and classroom contexts. Through our workshops and presentations at conferences, a wide array of faculty from diverse STEM (and non-STEM) fields have expressed interest in using Spotlights in class. The only somewhat time-consuming step in using Scientist Spotlights is the work done before the start of a course to select scientists, gather appropriate scientific and biographical resources regarding the scientists, and compose the assignment prompts. It might therefore be useful to nucleate a community of STEM faculty to build Scientist Spotlight modules for many different curricular areas. This could result in a database of ready-to-use assignments matching a wide range of content areas and could additionally build a strong community of STEM educators focused on issues of equity and diversity. We extend our appreciation to Kimberly Tanner, Jennifer Myhre, the monitoring editor, and three anonymous reviewers for providing valuable feedback with regard to this article and to Jahana Kaliangara and Monica Cardenas for assisting in processing and presenting preliminary data leading up to this study. J.N.S. thanks Sonya Dreizler, Veronica Neal, Mallory Newell, IMPACT AAPI, and the Equity Action Council at De Anza College for their support. The organizers of the Conference on Understanding Interventions That Broaden Participation in Science Careers kindly provided travel funding to support our presentation of preliminary findings from this work in a lunchtime plenary in 2015. IMPACT AAPI and the Office of Staff and Organizational Development at De Anza College have generously provided J.N.S. and A.S. with travel funds to present on Scientist Spotlights at national meetings. Learning Lens by Science in the Classroom is licensed under a CC BY-NC-ND 4.0 International License.